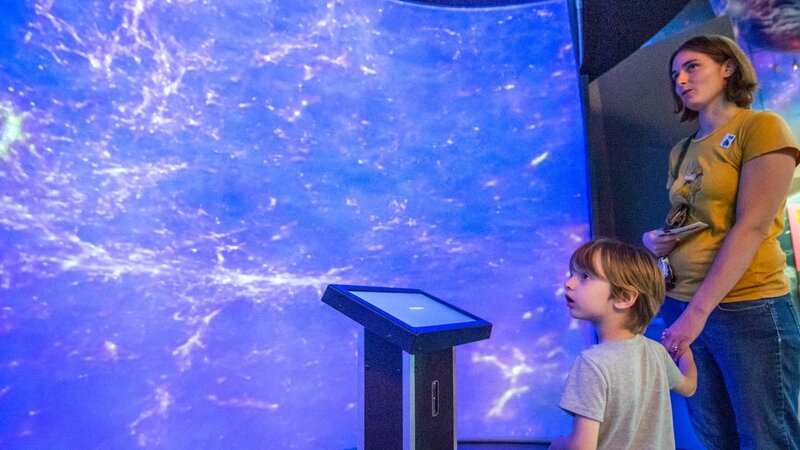 A GeoDome Panorama is a part of the Bell Museum‘s permanent exhibit gallery Life in the Universe, which launched in July as part of their grand opening. 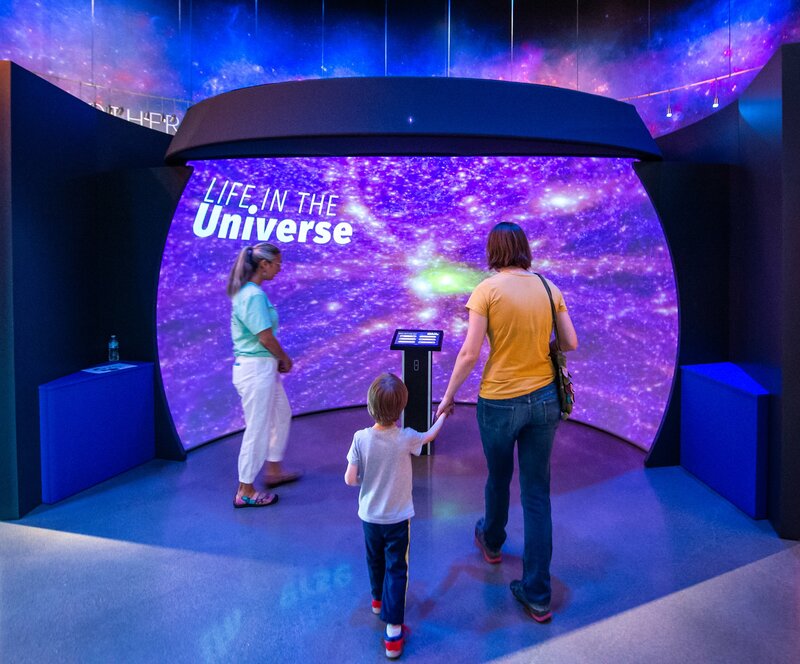 “The panorama is part of an exhibit that tells the story of Life in the Universe–what makes Earth special for life, how astronomers are searching for life beyond Earth, and how all of the elements essential for life were made from the big bang and inside of stars. 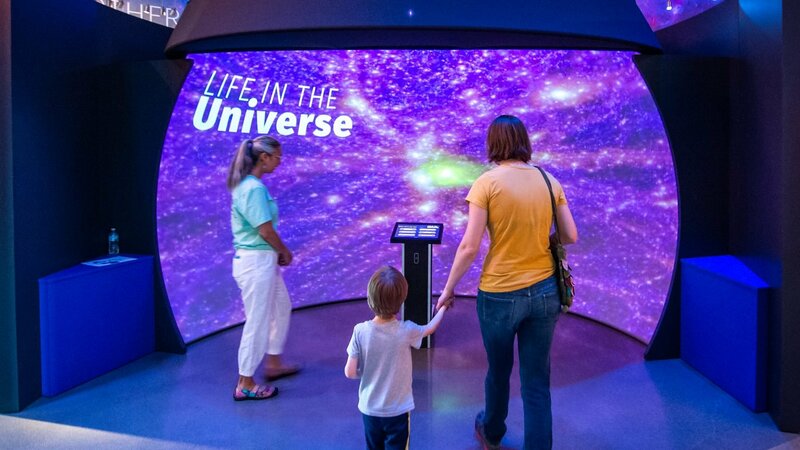 The Gateway allows the Bell Museum staff to incorporate new media to keep content in the exhibit current, such as displaying video of the launch of Parker Solar Probe, exploring a Mars dust storm, and celebrating NASA’s 60th anniversary. We also use the daily updated NASA Eyes software,” said Sally Brummel, Planetarium Manager. The Bell’s system features an OmniFocus 30240 projection system at 4K resolution, lighting a 4.5m-diameter semi-permanent OpenDome Panorama with 7,500 lumens. Visitors interact with content via a touchscreen interface, which we’ve integrated into a kiosk with our image generating computer. We also provided 5.1 audio, with speaker pockets designed into the screen fabric. Using Leap Motion and WorldViewer, we created a custom application to sense when visitors are nearby and launch an introductory “Welcome to Life in the Universe” video. After the clip, the touchscreen UI is live and visitors can explore NASA JPL’s Eyes platforms – Eyes on the Earth, Solar System and Exoplanets. Staff at the Bell maintain a “current events” section, using WorldViewer to keep content refreshed. WorldViewer is also used to launch pre-rendered video tours of astronomical data visualization using Uniview. An estimated 110,000 people will visit the museum each year. Press coverage of the grand opening is here. We’re excited to continue our relationship with the Bell. Their Exploradome program has offered an outreach program using a GeoDome Theater since 2006 (!) – with the original dome running for 11 years, then an upgrade in 2017. They are also the the founding partner of the Minnesota Regional Planetarium Network. These GeoDome systems are located in K12 school districts, universities, and museums across Minnesota, Wisconsin, North & South Dakota. The network shares costs, resources and programming opportunities, with a collaborative focus on teaching and learning in both fixed and portable GeoDomes.